The President hailed the Prime Minister's Rural Digital Literacy Programme, saying the government has started the world's largest digital literacy programme in the country. President Ram Nath Kovind on Monday said Aadhaar has helped the government in "eliminating middlemen" and save over Rs 57,000 crore. "Aadhaar has helped in securing the rights of the poor by eliminating middlemen. 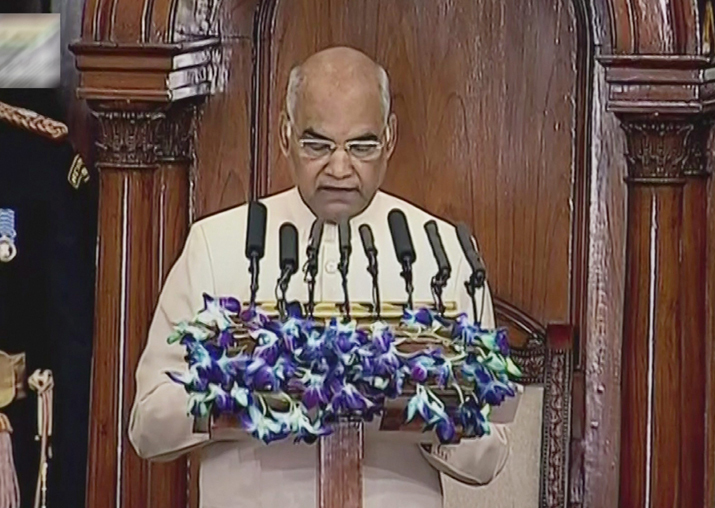 At present, digital payments are being carried out in more than 400 schemes of the government," the President said in his address to the joint sitting of both the Houses. He said through digital payments, the government was able to save over Rs 57,000 crore from reaching the middlemen. Kovind also said the 'BHIM' application launched by the government is promoting digital transactions across the country. "BHIM App is playing a major role in promoting digital transactions. The recently launched 'Umang App' has also made more than 100 public services available on mobile phones," he said. The President said in the electronic manufacturing sector, there are now over 113 mobile phone companies working in the country. "There were only two mobile manufacturing companies in India in 2014," he said. "Through this, the number of youths across the country are getting more opportunities of employment," he added. "Under this programme, the government has been able to make over one crore people digitally literate," he added.